Amaranth is a fairly recent discovery for me. I’ve been hearing about it for some time, but hadn’t gotten around to trying it until recently and I fell in love instantaneously. So much so that it has become my favourite breakfast seed. Much like Quinoa and Millet, Amaranth is actually a seed and not a grain, but can be used in many ways like a grain. I first experimented with Amaranth in a very basic porridge, made of 1 part Amaranth and 4 parts water. No frills, bells or whistles. I wanted to get an understanding of the flavour profile and texture. Surprisingly, it was delicious on its own with a mild, sweet and nutty taste. Unlike other grains which cook up fluffy, Amaranth is quite sticky and malty, but the seeds stay crunchy at the same time, giving it a wonderful and unique texture. The basic porridge is how I typically prepare Amaranth on a weekday morning when I’m pressed for time and need to get to work. I put it on the stove and let it cook while I’m getting ready. When I know I have to be out the door extra early, I prepare it the night before and just reheat it in the morning. That’s the wonderful thing about porridge. The only warning I have for you is, watch out for splatters. The first time I made it, I left it alone for too long and when I got back into the kitchen, it had splattered all over my stove top. As it thickens, the heat creates bubbles that pop and make a mess (kind of like leaving tomato sauce to boil with the lid off). So be sure to check on it and stir it frequently in the last few minutes of cooking time to avoid a mess. When I do have extra time, I like to get creative with my porridge. 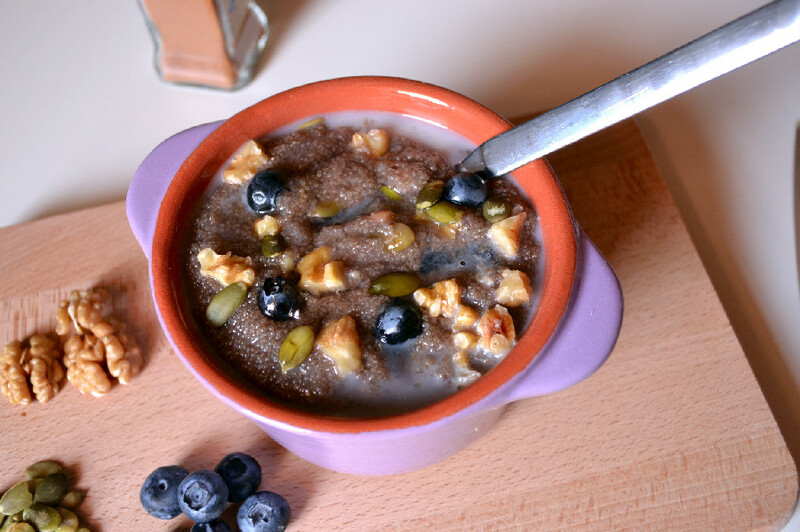 One morning last week I had some fresh blueberries on hand and I put them to good use in this Blueberry Amaranth Porridge adding walnuts and pumpkin seeds for crunch, and topping it with cinnamon, rice milk and a drizzle of brown rice syrup for good measure. Bring to a boil, reduce heat to medium-low and let cook uncovered for 25-30 minutes until the water has been absorbed. Be sure to stir it up from time to time so that it doesn’t stick to the bottom of your pot and to avoid splatters in the last few minutes of cooking. 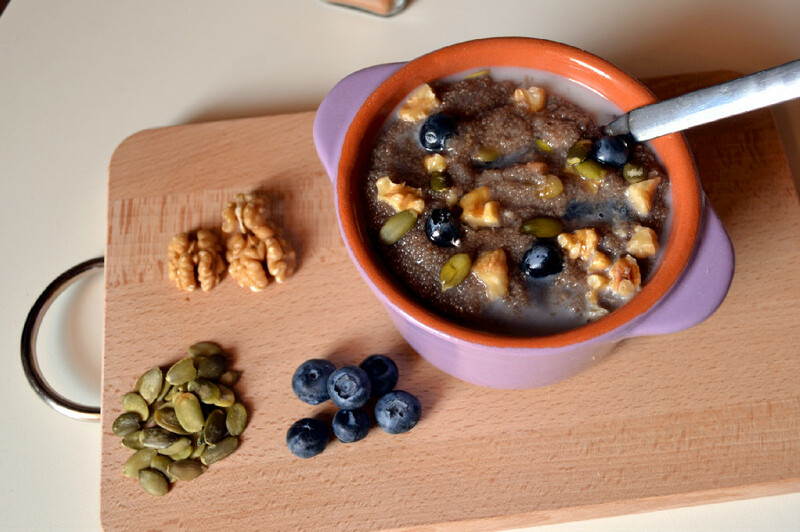 Once water has been absorbed, transfer porridge to a large serving bowl, top with reserved fresh blueberries, and lightly pan toasted walnuts and pumpkin seeds. Add rice milk and brown rice syrup and serve warm. If you do not have a mesh strainer, I highly recommend you get one. Not only is it handy for rinsing small seed-grains like Amaranth, Quinoa and Millet, but you can also use it to sift flour. 1/2 cup of uncooked Amaranth makes one huge serving, which I normally eat in one sitting all by myself if that’s the only thing I’m having for breakfast. I have a good appetite and I typically have a big breakfast, otherwise I’m ready to gnaw my arm off by 11am. If you’re a light eater or usually like to eat other things at breakfast, this recipe is enough for two smaller servings. If you want to adjust this recipe to feed more people, the important thing to remember is that you will need about 1/4 to 1/2 cup of Amaranth per person, and the ratio is always 1 part amaranth to 4 parts water to get a creamy porridge. I like to add some of the fruits, nuts and seeds to the Amaranth in the last few minutes of cooking to let the flavours come together and I like to reserve some to top the porridge. Some variations are strawberries and almonds, pecans, maple syrup and pears, dried apricots and pumpkin seeds, or any other combination of fresh or dried fruits, nuts and seeds that you like.